So, I succumbed to the charms of the Moleskine Notebook. 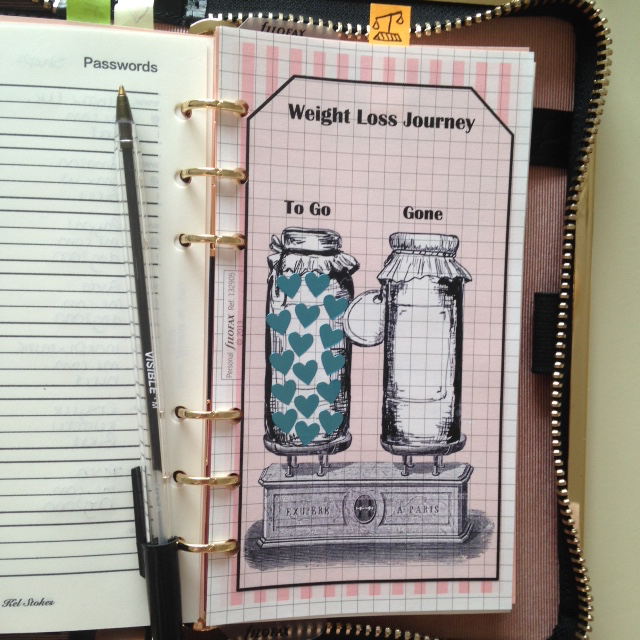 Traveler’s Notebook and Filofax users, please don’t be disheartened – I haven’t left you! I’m just trying new ways to streamline things. See, this is the problem. I want EVERYTHING together – my calendar, my bills information, my cash envelope system, a place to keep receipts, my passwords, my cards, my notes, my spending tracker… it’s proving to be rather difficult! The Midori Regular was perhaps the closest I could get to what I wanted. But it was NOT streamlining at all, it was heavier, bulkier, and I couldn’t even fit my notes notebook into the elastics as it was so full! Next was the Midori Passport – which was actually perfect… for my cash envelope system, and as a basic purse/wallet function. But I couldn ‘t carry my notebooks with me. I got a lot of compliments on the Passport whenever I went to stores – nobody had ever seen a purse/wallet like it. I’d hold up the queues explaining the brand and that it was primarily used as a notebook but you could switch up the inserts and completely customise to meet your requirements. I was browsing Pinterest for more information on the Traveler’s Notebooks and how others utilized their Traveler’s Notebooks – call me curious, but I get so many ideas from others, and I customize them to suit my needs. One thing that had been grabbing my attention for a while was this thing called a Moleskine. Sure, I’d seen these overpriced notebooks in the likes of Paperchase, WHSmith and Waterstones, but I just couldn’t justify spending over £10 on a notebook. Sure, they have diaries, but they also have blank, sketch, lined, dot and grid paper too. The things some of the more creative people had done with their Moleskines had me lost for words. There are many, many talented people out there. I wanted in! I thought long and hard, and came across a web page documenting how to create credit card inserts to place on a page in a Moleskine (or any other notebook). 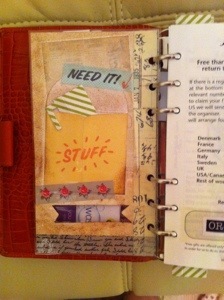 I wondered if I could do a similar thing but over 2 pages of a pocket size, to create the cash envelope system. But I’m a very curious cat… so instead of thinking very long, I bit the bullet, jumped in my car and shot over to my local shopping centre. I purchased my pocket blank notebook for £9.99 in Waterstones. 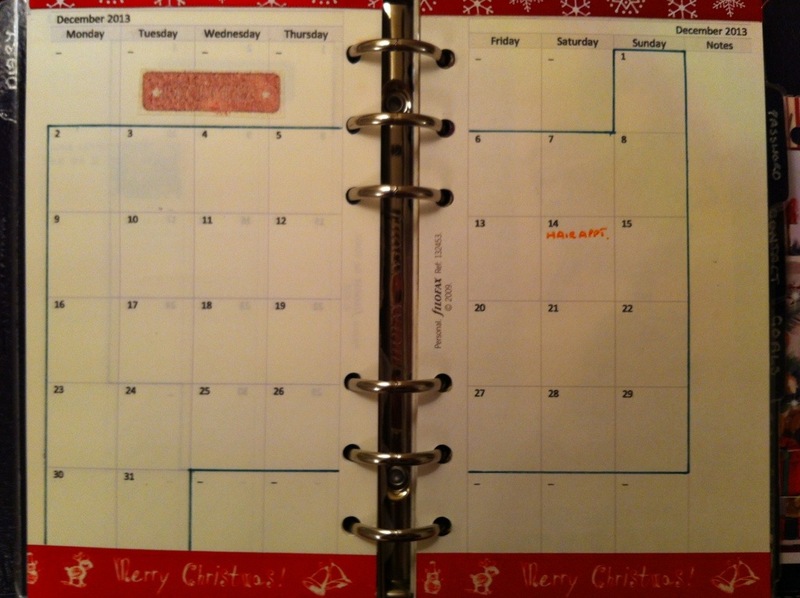 I decided on the blank because it meant that I could use the book for anything I wanted – I could create a calendar, I could doodle, write notes, create templates, glue things in… basically I could freestyle whatever I needed to. I had also read that the “unofficial” pen of the Moleskine was the Pilot G2, which I found in Paperchase also. In fact, I found the mini/pocket size. I purchased a black and blue. Getting back home, I sat at my table and looked a bit daunted at the prospect of having to completely begin from scratch. The first thing I wanted was to put the cash envelope system to use. I cut the back of my required amount of envelopes off and left a little lip to glue onto the pages, staggering each one slightly lower until they filled the pages. Next, I needed a pen loop. I ripped an elasticated pen loop from and old La-De-Dah scrapbook that I’d never used and pretty much just taped it into the back of the book. I placed a 2016 year overview calendar, a pocket size printable taken from Wendaful Designs printed out and glued into the book. Then I started working on the calendar. I decided I only wanted one for the next few months, as who knows, by the new year I might be using something else, or I may have stuck to the Moleskine, loved it so much and need a new one! In the calendar, I wrote my monthly bills in the dates they were due to come out of my account, I wrote any social events, holiday days, days my manager was not in the office, appointments and general things to remember. I colour code highlighting these events. After the calendar, I glued my monthly bills excel tracker in. 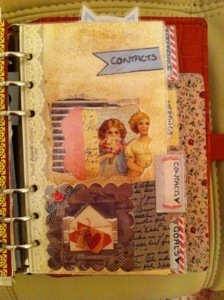 Then I added tabs using labels that I’d got left over. Got a sharpie marker and coloured the labels in black, then used a white gel pen to draw tiny little symbols to notify me what section is where. After all of that, I felt that the book was a little too “serious” still, and needed to inject a bit of colour, a bit of “me” into the whole thing. So, this is where my Pinterest and Google searches came in handy. I’m a lover of anything vintage inspired, or anything whimsical, dreamy, bohemian. They are my favorite type of photographs I love searching for, looking at and wishing I could take a photograph just as fantastic. I printed out a lot of photographs found mostly on google, creating photo collages and printing on normal printer paper to keep the book thin, and then cutting out and affixing to the pages using corner adhesives I’d purchased from Paperchase. I also used a photograph on the front of the notebook to give it a more personal touch. The paper feels sublime, very smooth and easy to write on – I love the cream colour of the pages, and the cover feels soft and slightly grained, very tactile! I chose the non-hard cover as I wanted the cover to be able to mould to the shape of the book and get that thumbed through, weathered appearance rather than it being rigid. 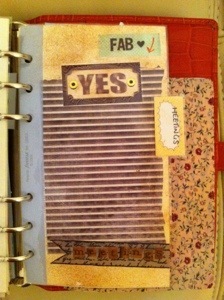 Have you ever used a Moleskine to plan/track/place notes/journal/as a purse (wallet) before? 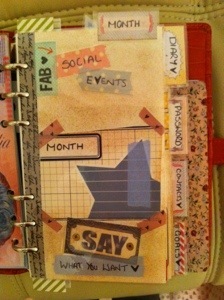 Last night I tweaked my Month on 2 Pages and made it available on my Free Inserts page (see above). The more I looked at it, the more I wanted to have a go at a Week on 2 Pages also. That is the blank page as it comes off the printer. Course, my decorating is a little boring etc, but I’m just trying to get the point across that the pages can be jazzed up to your own taste etc. It’s my birthday today! Although, technically not until I wake up ;). I’ve spent my last evening as a 27 year old working on a set of MO2P (Month On 2 Pages) using Microsoft Word. I currently use Ray & Steve’s (My Life All In One Place & Philofaxy web pages: I’m doing this on my mobile and it’s playing up so I’ll have to link later) printable inserts, but me being me, forever churning with ideas and “I wish I could have a go at that” mentality… Well, it just had to be attempted. Originally for 2014 I was going to print off another set of Ray & Steve’s inserts, and I even did this… But I kept having issues with the document (February just wasn’t printing for me). 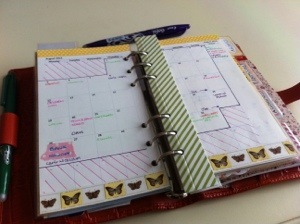 I even looked into the Filofax’s own but could only seem to find this in the stores in white, no cotton cream. So I began my search online for a template. 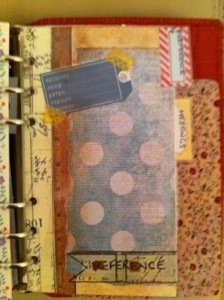 As the search began, I wanted to find a full set of Monthly inserts detailing the months and dates etc. but there were some really cute dateless and month-less inserts around, I kind of got converted! The ones I did see however, were already decorated. I like to decorate my own pages (gives me sense of achievement therefore I am more likely to look at it and utilise it, it’s just the way I am). 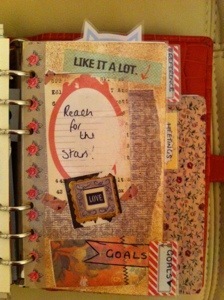 So a little voice in my head began to get louder “why don’t you have a go, just use the templates for inspiration etc”. So I had a go. It’s not great and even a little plain, but it’s my first attempt. 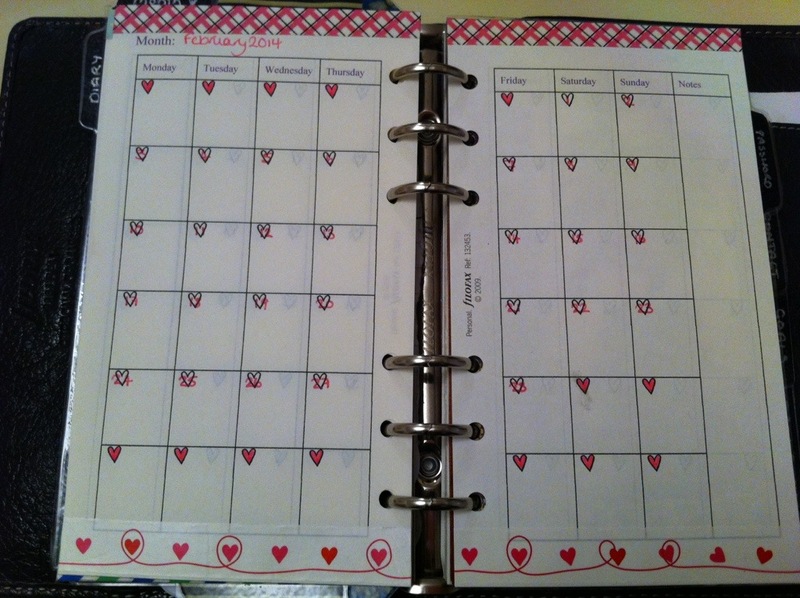 The hearts to put your dates in need to be a little more transparent so you can see the dates… But for me, it is laid out exactly as I need it so that I can washi tape it up and decorate it to my taste etc. If anyone is interested in this insert I can make it available to download 🙂 maybe I can change the shapes to suit more: a car shape, a star shape, an apple shape, a house shape, anything! After chatting with my Best Friend Carrie tonight who was interested in how I set my planner up (the way it works for ME), I figured as I’m incredibly happy with my system I would put more information on the way I go about setting up my Month and Weekly view diary pages. For my setup I always begin with my Month To View pages. Then I transfer across to my Week To View, but I’ll get to that shortly! 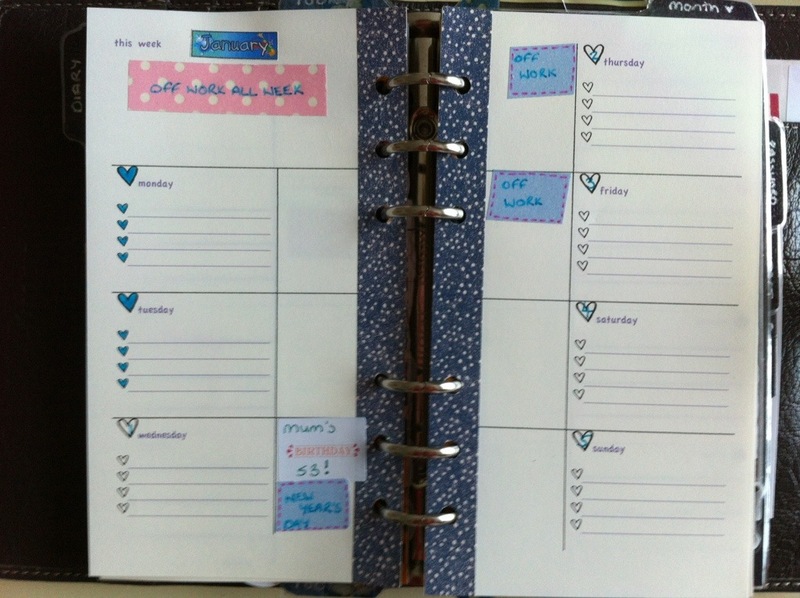 As you may know already from a previous post briefly mentioning what is in my Filofax, I use the Philofaxy/My Life All In One Place Month To View printouts which I decorate with Washi Tape and then draw around the entire month’s boxes in a coloured pen. 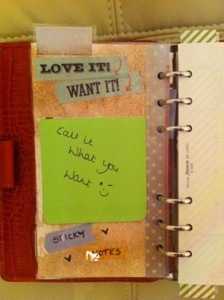 Here is an example of how my page looks like before my scrawls and colour coding system takes hold of it! When I’ve completed my decoration, I then use my coloured Pilot Frixion Erasable Pens to mark out my colour coding system in the Notes Section on the far right hand side of the page as you can see below. 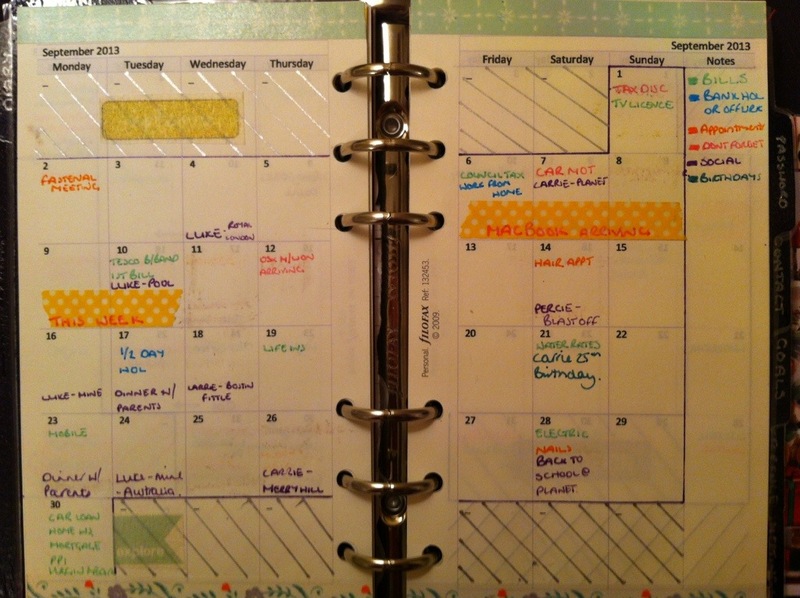 They are all plotted out on my month to view using my colour coding system as you can see below. At this point I would begin transferring my data over into my Week To View, but more on this shortly. Below is an example of this month for me at a glance. You can see that it’s been padded out with social events and appointments. Usually, I try to put my events in the order that they will be done. This means during the week my social events (purple) are generally at the bottom of the box because of work I can only really socialise on the evenings. 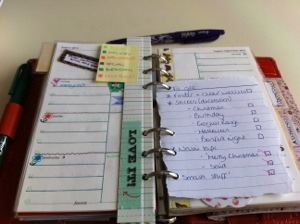 It allows for room in case anything crops up that I need to add in (a work appointment for example). With the week to view, I do not put much detail – like times and addresses or in depth arrangements. It’s just what’s happening, which date. Now then. Once I’ve got all of my month set up to the point where I’ve inputted all of my bills, birthdays, national holidays/work holidays, social events that have been planned in advance etc… I transfer them over into my Week To View diary pages. 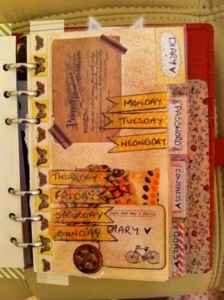 My week is the Standard Filofax Week To View. Honestly, I tried using others, noteably a day per page with appointment times, but once I stopped Repping every day I found it took up too much space in my Filofax and therefore decided to try other methods. This method works for me best. I’ve split my pages into 2 parts, added lines and checkboxes to one part, and the part closest to the rings are left blank. 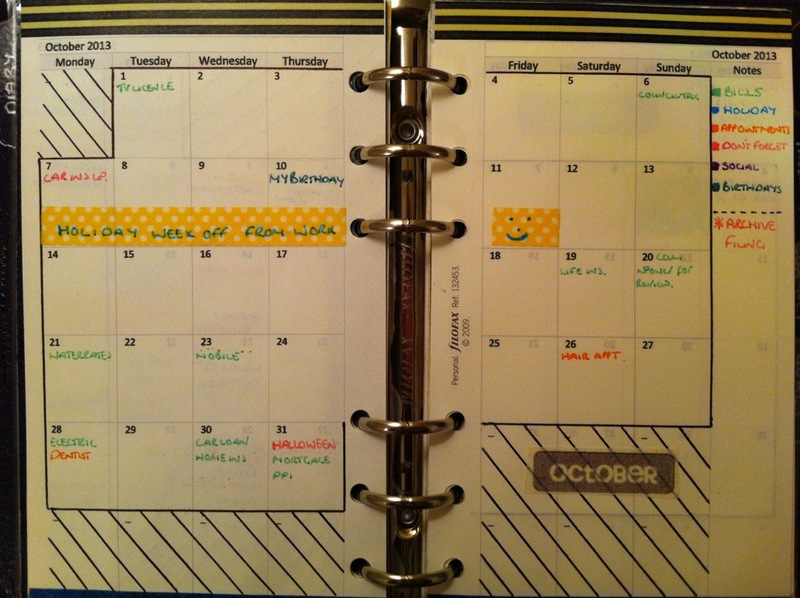 Once I’ve had fun decorating with washi tape, my colour pens doodling around the dates and highlighting the month and the days, I use the “inner section” – the part closest to the rings – to import my Month To View calendar events (sometimes using the Event Stickers I make), and also in this area, expanding on the information, such as times. The colour coding system is still in force in this area. I only use this area for whatever you see on the Month To View (except if there are films on TV I want to watch). For example, you can see in light green on Monday I had a Direct Debit scheduled for my Mobile Phone Bill. I also had dinner with my parents and then a skype chat planned (including a time) – both in purple. You can see on Tuesday evening I had a date night with Luke at mine planned at 7pm – in purple as it was classed as a “social event”. All of those examples are on my Month To View. The last section, or the “outer section” – the section with the checkboxes, are not colour coded, and they are merely daily to-do-lists for me to fill out the night before or even during the day etc. They also aid in my working life when I need to chase an order up a week in a week or so’s time. 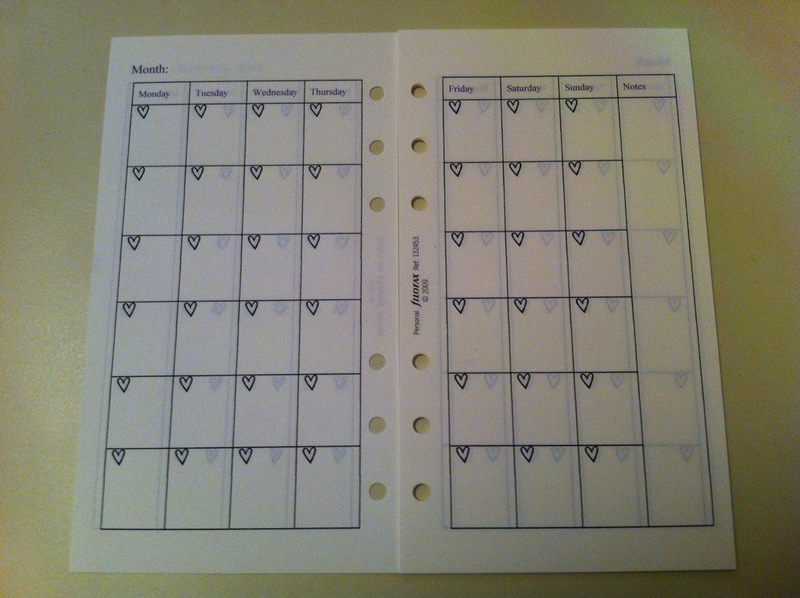 I also use my first section of the week – the part that says “this week” usually above the Monday on the Standard UK Filofax Week To View – to record things that are going to happen over the course of the week; eg, if I’m off work on Holiday all week, it’s on there. If my parents are abroad that week, it’s on there. Anything that is happening that week – all week – is in that section. I hope that’s given you an insight as to how I plan my pages out a little more, I know it sounds like a lot and a lot of time and effort go into it, but I think the most time is the initial set up – figuring out how I wanted things to look or work for me. After that, it’s all about the maintenance and keeping things up to date as much as possible. 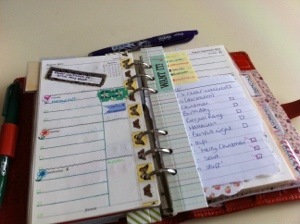 I spend a couple of minutes updating my Filofax every day to ensure I don’t miss anything out. I’m not saying this is the perfect setup – if I’d have had this setup myself a mere 6 months ago it would not have worked for me in my Repping Role. What works for one person will not work for someone else. It all depends on how much time you want (or are able!) to take out to organise your life effectively. I’m a very orderly person, but also very visual, so things at a glance as well as up close are important to me. I need to see the whole picture, divided up as much as possible. 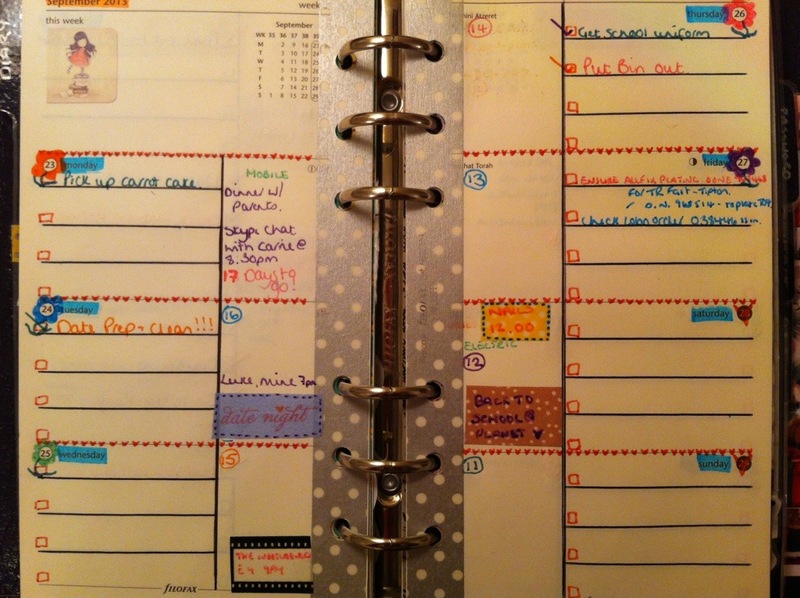 I need colour, something that attracts me to want to look at my planner often enough to want/feel inspired to complete the tasks I set myself – or even, to set myself the tasks in the first place! How does your setup work for you? 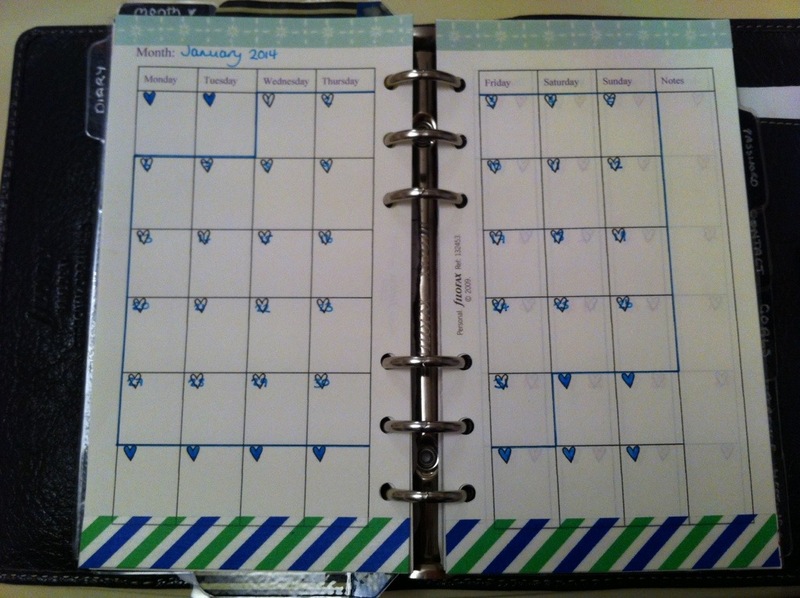 Have you tampered with different setups and are currently in the dreaded “planner fail” area right now? 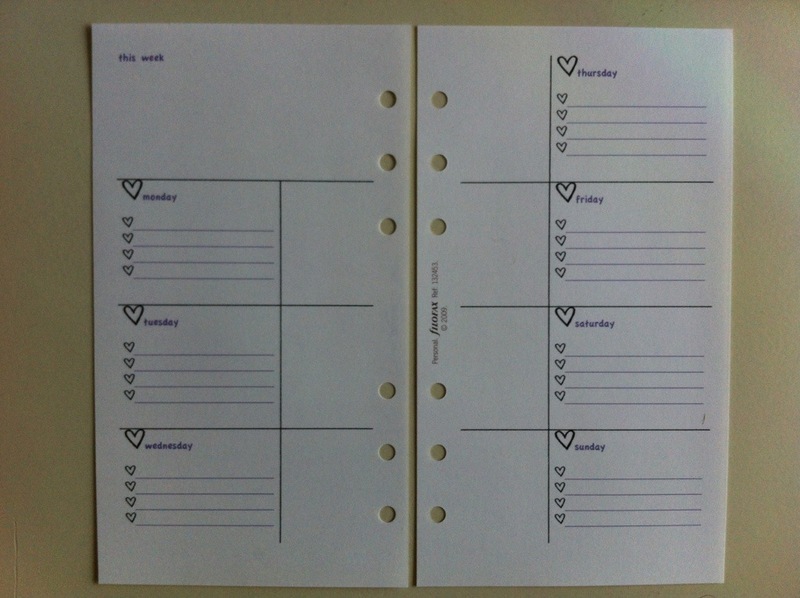 Quick update today: I popped to my local hobbycraft today as I had seen a line of really really funky stationery called “Smash”… And I had to have a go at using a couple of bits and bobs of theirs in my Filofax. Since my dividers have been a little bland and boring lately and a few of them were “redundant” due to my work role changing from external to internal, I had been meaning to change some of the dividers when I got around to it. 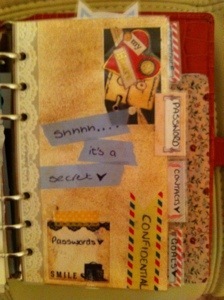 I decided I should have a new change around as well as new dividers etc. Well, you know what I’m like, constantly changing stuff! Here are my new dividers! I also apologise for my awful handwriting, but I wanted it to look more of a scrappy feel and extremely personal. 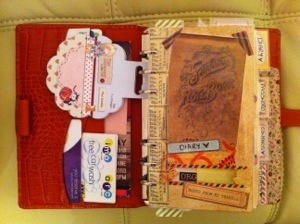 So there we are… I’m ready to step into Autumn with my new updated and revised dividers… Have you updated yours recently?